AFFORDABLE YET DURABLE. Affordability without compromising the durability aspect is what our student driver magnet for car can boast of. You can afford it and you can even buy bulky orders of this product. GREAT COLOR COMBINATION. The used colors for this student driver sticker are awesome. The combination of yellow and black is suitable for the student drivers. DESIGN FIT FOR YOUR NEEDS. Not just the right price and durability, this magnetic sign is fit for your needs. The design itself comes out after a series of research. FIT FOR NEW DRIVERS. When you’re about to learn how to drive, you need this product. This is fit for you as you need a sign for other people to recognize. DESIGNED TO PROVIDE CARE & SAFETY. Another feature of our magnetic sign is safety. We care for your well-being while you’re learning how to drive. You have to be safe all the time; thus, this is made for you. We take our pride providing a magnetic sign for a student driver with 100% satisfaction guarantee. This student driver sign is American made. Thus, it is ensured to be durable and fit for your needs. We have a 100% Money Back Guarantee exclusively for you. Click ADD TO CART right now to have student driver signs for car! ✓ Official US Dept. of Transportation – Our Student Driver Magnets utilizes the official US DOT highway sign font, chosen for its readability and legibility at far distances. ✓ SAFETY – Large Black block lettering with a safely yellow reflective background provides safety to new drivers. 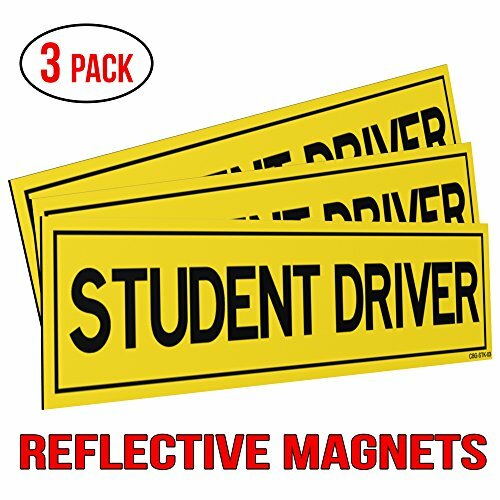 ✓ BEST STUDENT DRIVER MAGNET FOR CARS – This is the best magnetic sign purposely made for those who want to learn how to drive. Printed on reflective material and laminated for outdoor use then mounted on high-quality magnetic sheets. ✓ LONG LASTING MAGNETIC SIGN – Why choose those inferior student driver magnetic sign on the market? This high quality magnetic sign will not fly off when driving like some of the others. Test to last well pass the new driver stage. The student driver magnets are made to last a lifetime.